Gratins are a great way to eat your vegetables, especially in the winter. Who can resist bubbling pots of roasted vegetables and winter greens, crispy golden on the top and cheesy-creamy in the center? 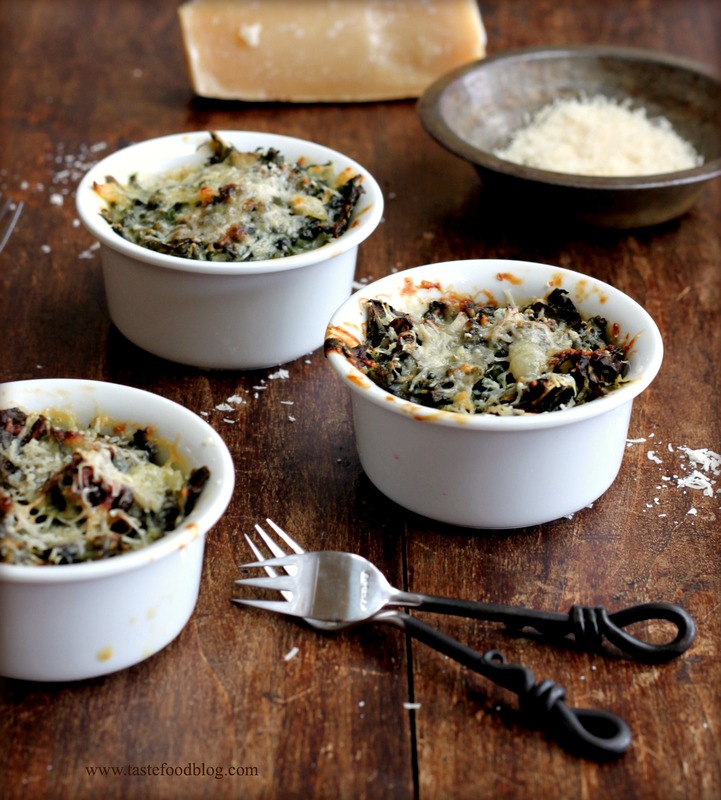 Hearty earthy greens, such as kale, spinach and chard, stand up exceedingly well to rich bechamel and melted cheese (what wouldn’t?) Serve in a large gratin dish for family style dining or spoon into individual ramekins for fancy serving. Either way, you can be sure that everyone will be eating their greens. Preheat the oven to 350°F. Heat the oil in a deep skillet or wide saucepan over medium heat. Add the shallot and saute 1 minute. Add the kale and saute until slightly wilted, about 2 minutes. Remove from heat. In a medium saucepan, melt the butter over medium heat. Add the flour and cook, stirring, until light golden, about 2 minutes. Whisk in the milk and cream. Simmer, stirring, until thickened. Whisk in 1/4 cup cheese, the salt, pepper and nutmeg until the cheese melts and the sauce is smooth. Pour over the kale and stir to combine. Transfer to a buttered gratin dish or individual ramekins. Top with the remaining cheese. Transfer to oven and bake until the tops of the gratins are golden brown and bubbly, about 25 minutes. Serve warm. What a great way to eat Kale! No problem. I just bought 2 bunches of beautiful organic red kale at Fairway Market and thought I would need to buy more. The weather is awful here on Long Island and I didn’t want to go out again.Can’t wait to prepare your dish.Thanks for the great recipes. Seriously good way to eat kale! A wonderful idea and scrumptious gratin! I’m going to get some Kale and do it. It looks very yummy. I love kale and I love cheese. Can’t wait to try this! We baked kale last night and loved the results. This looks amazing! What a perfectly delicious way to have kale! It’s such a wonderful wintery dish. I just found the freshest kale at the Farmers’ Market and couldn’t resist buying 2 deep evergreen hued bunches. The gratin recipe is just the inspiration I need for this weekends menu! Once again, I love how you individualize your servings of this tasty gratin.